5 Tons Of Nutella Stolen From German Town: What Else Did They Steal? A central German town has been struck by food thieves yet again. The AP reported on Monday that an unknown number of thieves stole 5 metric tons (5.5 tons) of Nutella from a trailer in the town of Bad Hersfeld. 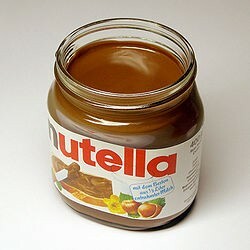 The chocolate-hazelnut spread, which is manufactured by the Italian company Ferrero, was said to be worth an estimated 16,000 euros ($20,710). Seven pallets loaded with jars of the spread had been swiped sometime between Friday afternoon and Sunday night from a truck trailer. The trailer had been parked in an out-of-use railway station. German newspaper The Local wrote that only two weeks ago, a trailer full of coffee worth 30,000 euros was ransacked in the same town. And several tons of the energy drink Red Bull were swiped -- again from a truck trailer -- in the nearby town of Niederaula a few weeks ago. Hessian police spokesman Manfred Knock acknowledged to The Local that the crimes were probably related, and when asked if someone might be stealing the items for an enormous breakfast, he replied laconically, "That's what it looks like." Police were appealing for any information which might help them get a lead on the case. The series of thefts marks perhaps the largest food theft since 2012, when millions of dollars of maple syrup were stolen from a Quebec warehouse -- a facility which is said to house 10 million pounds of maple syrup in barrels, the equivalent of half the yearly US production of the syrup. Also in 2012, Nutella became the object of a lawsuit when four American mothers filed class-action suits claiming that Nutella engaged in misleading marketing in order to sell its product. The women said words like "nutritious" and "healthy," used in the company's television ads, led them to believe that the spread they were feeding their children for breakfast had nutritional value, when in fact it contained twice as much sugar as jam or syrup and contains little protein. Nutella agreed to a $3 million settlement. Likewise, the US-based distributor of the product agreed to modify information in its advertising campaigns to better suit the content of the spread. The energy drink Red Bull, stolen from a trailer in Niederaula, has apparently been a popular target of thefts in the past in the United States. In 2011, a string of Red Bull thefts made news in southern California, with police saying the drink appeared to be in high demand for resale.